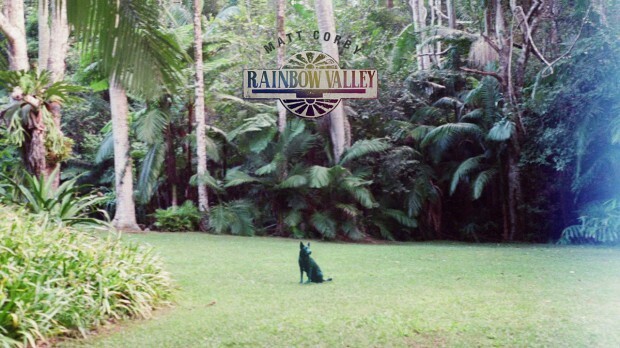 Matt Corby’s Rainbow Valley is lush, textured and dream-like, combining the layered complexity we know and love from his previous works with a new wave of driving, groovier beats. The much-anticipated sophomore record to follow his #1-charting debut, Telluric (2016), Corby splashes flavours of soul and psychedelia throughout this well-constructed record in an honest and reflective manner. The album begins with ‘Light My Dart Up’, a soft and resonating folk piece, accompanied by light guitar plucking, pulsing drums and some now-signature Corby flute. Matt’s low, almost rumbling voice in the opening is contrasted immediately as he jumps into a higher register to deliver stunning vocal runs throughout the track. His first single, ‘No Ordinary Life’ follows; its magical harp and piano lines creating an oddly-nostalgic feeling, despite being completely fresh. Corby’s wandering vocals and punchy drums ease the listener into a dream state, almost reminiscent of some recent Kevin Parker/Tame Impala works. The additional two singles he released prior to the album, ‘All That I See’ and ‘All Fired Up’ slot perfectly into this body of work, with their natural samples and reflective, open lyrics proving that Corby is just as talented as ever, even after a few years hiatus. A 30-second interlude (a soft, distorted string rendition of the ‘All That I See’ melody) separates the subtle differences in message and feeling in the album. Appropriately named ‘How It Ends’, the track marks the transition between the nostalgic, reflective elements of the first five tracks and the upbeat, energised vibe of the second half. ‘New Day Coming’, ‘Better’ and ‘Elements’ are particular stand-outs in terms of groovy, textured songs that demonstrate this change in tone. The constant hints of neo-soul and psychedelic instrumentation throughout the record are brilliant and exciting to listen to. On Telluric, it was noticeable that he was trying to steer toward this direction and I think he’s finally arrived there. Singing every harmony and playing every instrument has made it clear that this album is 100% the sound that Corby desires. However, it’s warming that Rainbow Valley doesn’t seem out of place amongst his other discography. It’s very Matt Corby – packed with complex, layered harmonies and brave lyrics whilst simultaneously presenting something new; intriguing basslines, future-psych synths and driving percussion that holds it all together. Rainbow Valley is beyond excellent. Equally relaxing and energising, uplifting and humbling, the record marks a distinct sound – not a change, but rather an evolution – for one of Australia’s most-loved talents.